Houston’s Decisio Healthcare, a health IT company that makes software to create a critical care dashboard for ER and ICU staff, is now FDA approved. That distinction is notable, since seeking and obtaining regulatory approval is rare for medtech software companies. Most companies in the electronic health records industry are classified as medical device data systems and, therefore, don’t need the FDA sign-off. “We believe we may be the first Web native-only software cleared by the FDA for clinical use,” says Gray Hancock, Decisio’s co-founder and COO. Hancock says that he and co-founder Bryan Haardt, the company’s CEO, felt that their software in essence acts like a medical diagnostic device, helping healthcare providers treat patients. “We did not want to go to market with a product and then get a knock at our door from the FDA shutting us down because we did not get clearance first,” Hancock says. More importantly, he adds that they believed having the approval would help Decisio stand out in the marketplace and make their customer base of physicians and hospitals more comfortable. “Our product has stood up to the rigor of FDA clearance and quality control,” he says. The company was founded in April 2013, and very soon after set up a beta test at Houston’s Memorial Hermann Hospital, one of the nation’s busiest trauma centers, which treats more than 6,000 patients each year. 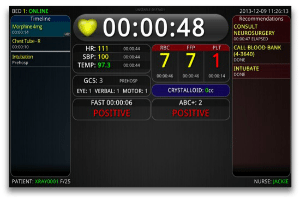 Decisio’s software takes the data in the multiple flashing monitors typical at a patient’s bedside and consolidates them onto one screen, creating a one-stop dashboard that flags items that need attention. The software is licensed from the University of Texas Health Science Center in Houston. The company has raised a total of $2.5 million. FDA approval in hand, Hancock and Haardt are now focused on getting the software to market. To help them, they are partnering with Beacon Partners, a Boston area consultancy that specializes in health technology. “This allows us to continue to focus on developing clinical software, while leveraging Beacon’s resources to deliver great customer support,” Hancock says.